The success of the NDPL Energy Club spurred its parent company Tata Power to scale up the programme. This lead to the setting up of the Tata Power Energy Club (TPEC) in Mumbai in association with REACHA….in 3 schools to start with. 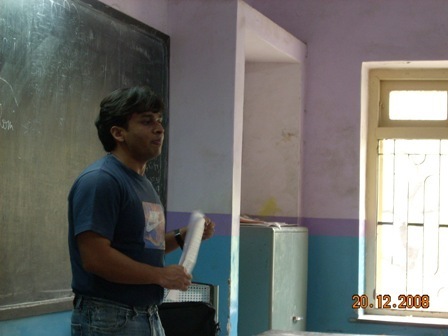 Project spearheaded in Mumbai by REACHA Volunteers lead by alumni of premier institutes NITIE (http://www.nitie.edu) and IIT - Bombay (http://www.iitb.ac.in). They can be seen in the photographs on this web page conducting classroom training sessions. Special campaigns have been carried out to convince schools, teachers, students, parents and neighborhoods to shift towards the purchase of Star Rated Bureau of Energy Efficiency (BEE; http://www.bee-india.nic.in/) compliant electrical and electronic devices. Once the consumer buying pattern shifts towards energy efficient devices, the rate of growth in energy demand due to extra purchase (due to the ever increasing purchasing power of the consumer) of these devices is likely to slow down…and even decline over a period of time. This will have a direct impact on reducing every individuals 'carbon imprint' on Mother Earth. However, one has to understand - old habits die hard, and consumers will take at least 2-3 years to understand and implement this approach. The first six months of the TPEC program have been encouraging and quite successful in moving from boot-strapping mode to imbibing energy saving concepts in more than 2200 students. REACHA feels that the next 6 months would accelerate energy saving habits that are likely to be sustained by the targeted consumers. This Demand Side Management (DSM) effort could have a direct positive impact on reducing Mumbai’s peak hour energy deficit if appropriately scaled up over the next few years. Tata Power/NDPL have won Power Awards where the Energy Clubs have played their part.